This property is located at 19-21 Penywern Road in Greater London. Check room availability using the search box on your right. You will find the hotel just yards from Earls Court London Underground Station. Free Wi-Fi and stylish, modern air-conditioned rooms are offered as standard. 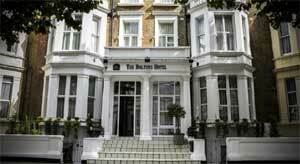 The Best Western Boltons Hotel has a terrific location, in the centre of London's famous Earls Court district. The Olympia Exhibition Centre and the Commonwealth Institute are both within easy walking distance. It also enjoys excellent access to London's transport network and for pleasureseekers it couldn't be better as the hotel is just a few minutes stroll from the West End and London's vibrant nightlife. All of the en suite rooms have air conditioning and flat-screen TVs with satellite channels. Free wireless broadband is available throughout. A buffet breakfast is included in the price. After a recent 2-million-pound renovation, the hotel is now home to over fifty well-appointed and stylish contemporary bedrooms.